You can become a more visible, effective and impactful researcher by sharing your research data and publications openly. In this course, you will learn the objectives, main concepts, and benefits of Open Source principles along with practices for open data management and open data sharing. You’ll learn to establish links between publications data and methods, how to attach a persistent identifier and metadata to your results, and methods for clarifying usage rights. You will also discover ways to apply these principles to your daily research and adapt existing routines. Finally, you’ll uncover potential barriers to sharing research and discuss possible solutions. How can researchers effectively store, manage, and share research data? What kinds of open access publishing are most effective? How can researchers increase the visibility and impact of their research? How can the use of social media contribute to the visibility and impact of research? You will apply the topics of the course to a variety of case studies on Open Science adoption, which you will then discuss among fellow students. You will also be presented with a hands-on guide to publishing your research with open access. This will help you to apply Open Science principles in your daily work. It will enable you to implement and benefit from the Open Science policies that are currently being developed by governments and research institutions. This course is aimed at professionals. Those who will see the most benefit include academic researchers at different levels: PhD students, postdoctoral researchers, and professors; researchers working for governments; researchers working for commercial enterprises; MSc and BSc students interested to learn about the principles of Open Science. Open Science: Sharing your Research with the World by TU Delft OpenCourseWare is licensed under a Creative Commons Attribution-NonCommercial-ShareAlike 4.0 International License. 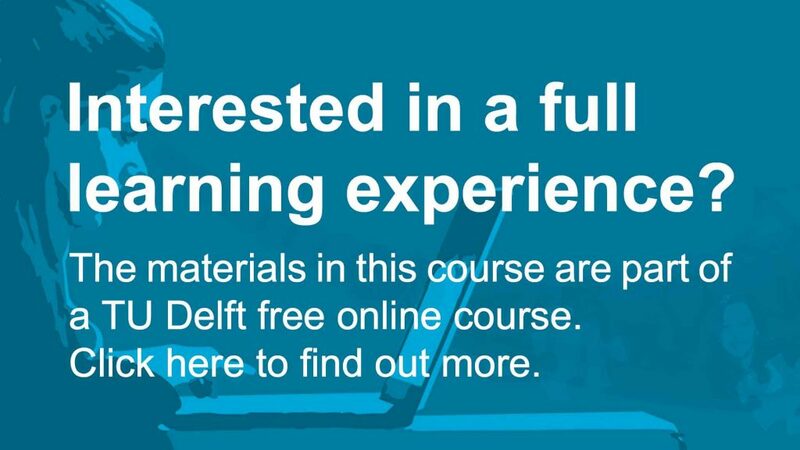 Based on a work at https://online-learning.tudelft.nl/courses/open-science-sharing-your-research-with-the-world/.